From the beginning, visiting Custom Auto Service has been like going back in time to an old Packard Dealership, the kind of place your father or grandfather may have taken you when you were a kid. Located in a 1919 electric car garage and dealer showroom, Custom Auto Service is a place where time stands still, a place where you are surrounded by the grand tradition of classic automotive art, an old fashioned business with old fashioned values. A walk through the establishment — housed in a building that was home to an electric car dealership early in the last century and later a truck dealer — is a step back in time to delight any car buff. Though the last cars to bear the Packard name were built in 1958, the marque is alive and well here. In the showroom, amid much memorabilia, are impressively restored examples, such as a spectacular 1954 Packard Caribean and a fully restored 1937 Super Eight Formal Sedan. Both show winning examples of the Packard marque. “They’re timeless. Ageless,” Escalante says, his enthusiasm obvious. One look at the massive cars’ elegant proportions, flowing lines and tasteful chrome and you know he’s not exaggerating. Packards have always been a cut above. In the 1920s, the marque outsold Cadillac and was considered the American Rolls-Royce. In the 1930s, the cars were owned by heads of state and movie stars like Gary Cooper and Clark Gable. Today’s Packard owners include Johnny Depp, Jay Leno and writer Harlan Ellison as well as such Orange County aficionados as entrepreneur Mike Harrah, developer Gen. William Lyon, auto dealer Donnie Crevier and radio station owner Art Astor. In some cases, Escalante sold them their cars. 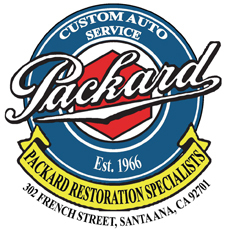 Authenticity is the byword for Custom Auto Service restorations — Packards entrusted to this establishment have been completed and competed successfully throughout the country at numerous Concours.